Vismara Marine has recently tested its latest sailing yacht, the 30-metre Bebivi, right after her launch back in May. 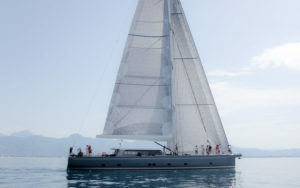 Bebivi is nearing delivery, which is scheduled on the occasion of the upcoming Genoa Boat Show in September. Bebivi is a performance-cruiser sailing yacht built in composite materials, with the hull and deck constructed entirely out of carbon to ensure she is light and fast. She also has a carbon mast and boom. A retractable keel with the addition of two winglets on the bulb is designed for maximum stability and sailing performance. She has twin rudders and helm controls are found in both cockpit and an internal wheelhouse, with the addition of a joystick for ease of manoeuvring. Bebivi was designed to create a distinction between the owner/guest and crew living areas, so the layout is divided into two zones. Aft is the engine room, and crew area with two cabins, two bathrooms and a large living room and kitchen. At the bow there are spaces dedicated to guests and owner with two guest cabins with bathrooms and showers, and a large master cabin with sitting area, bathroom and wardrobe. Accommodation is provided for six guests and four crew members. Plenty of space is left for living areas, dining and lounging areas throughout the interior. The high deckhouse design creates an extra spacious environment inside the saloon and allowed designers to experiment with darker shades of panelling and materials to achieve the owner’s desired look. As for her power and performance, Bebivi is powered by twin 300hp Cummins QSB 6.7 diesel engines. There are two generators with lithium batteries that can power the air conditioning when the gensets are off. Her twin rudder configuration delivers maximum manoeuvring capabilities under any conditions and is backed up by twin helm stations.